Since the time I remember, I have been looking for the perfect fusion of Indian and western world. Wont it be Amazing if we can get the best of both worlds !! Whether its food, festivals or clothes, fusion always sounds just perfect to me. Talking about fusion outfits, a good one is difficult to find. 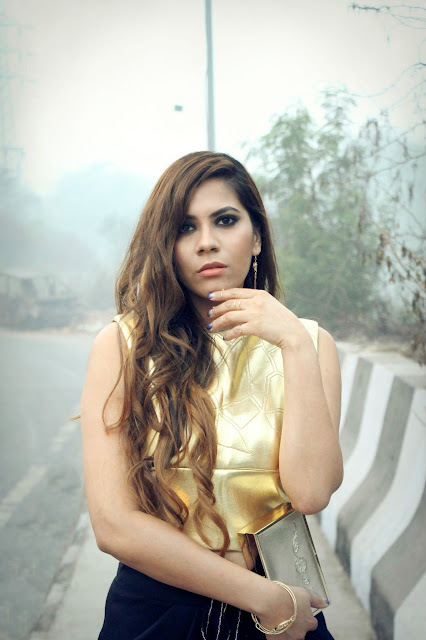 As I said in my post Understated Glamour where I styles Kanelle Maxi Dress, there are so many occasions when you don't want to go out in western clothes and you know every single person will be in Indian wear. So to look different, fusion clothes us the way to go. But sadly, its rare to find a good fusion piece. This Kanelle by Kanika Jain is a good combination of modern and ethnic wear. The pants, a modern take on dhoti salvar look chic paired with the metallic gold top. This is one outfit that I slipped into and i was like, Ok, now I feel all ready to conquer the world. It like sassy and feminan. The clean cuts of pants and the very subtle detailing of the top is perfect for a person who wants something different. Kanelle by Kankia Jain is all about women who loves timeless trends, who like minimilastic and wearable fashion. I see myself pairing these Dhoti pants and gold metallic crop top in so many different ways, such versatile pieces they are. One thing is for sure, now I know what I am wearing as cocktail or party outfit whenever next event comes up. Beautiful outfit Dear! top is amazing!!! Wow! Fantastic outfit! I like make-up too! Your golden top is TDF Poojia! Great look! Love the top! I love your hairstyle and make up! Love this gold top on you! What a chic ensemble! 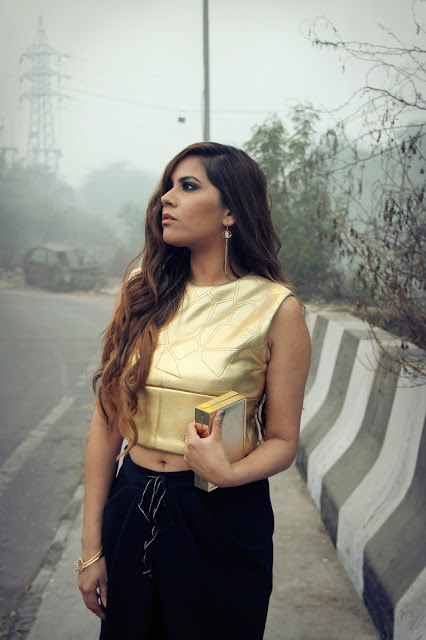 I love this gold crop top and your metallic clutch is totally fabulous! Amazing outfit. You look very pretty. Such a beautiful look girl. Can I have your gold crop top? It's stunning. ​Thank you for​ the lovely​ comment on my blog.